I thought that as I have been getting better acquainted with my sewing machine recently, and as I have plenty of fabric left over from the fleece blanket that I made the giant soft toy pig from, I would put together a sewing pattern and tutorial of my own. As many readers noted, the colour of the fleece I was using did suggest a fox, so I decided to make a cute but simple case to fit either my Kindle or iPad mini, which are very similar in dimensions. The instructions given here are to fit either device or any similarly sized device, but the pattern is constructed from very simple shapes and would be easy to scale up or down for phones, larger tablets or even laptops. For those who prefer to get away from technology once in a while, you could even make one to hold a precious notebook or sketchbook. The finished device cosy uses less than half a metre of fleece fabric in the main colour, a small scrap amount of white fleece and very small pieces of brown and black felt for the features. If you use a £3 Ikea blanket as I did you should be able to make five or six cases, perfect for very inexpensive gifts. The slightly more complex shapes are provided on a free to download PDF. I have given the measurements in case you wish to draw the remaining pieces up yourself, but in the most part I would recommend printing the PDF at 100% size (with no shrink to fit setting applied) and using the pattern as given. Please note that there should be no seam allowance given to the curved edges and bottom of the nose of the fox’s orange face piece. 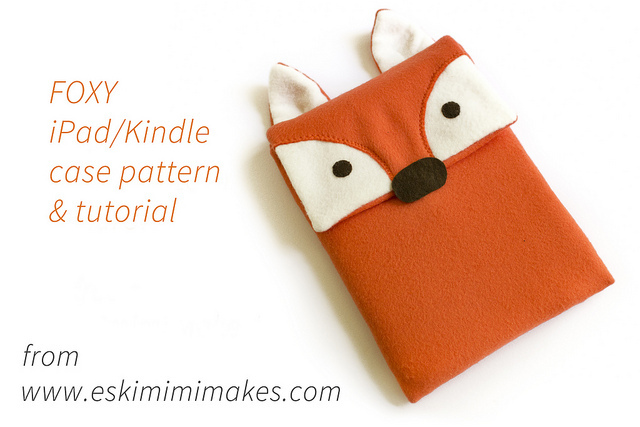 Once all of your pattern pieces have been cut, begin making your FOXY iPad or Kindle case. 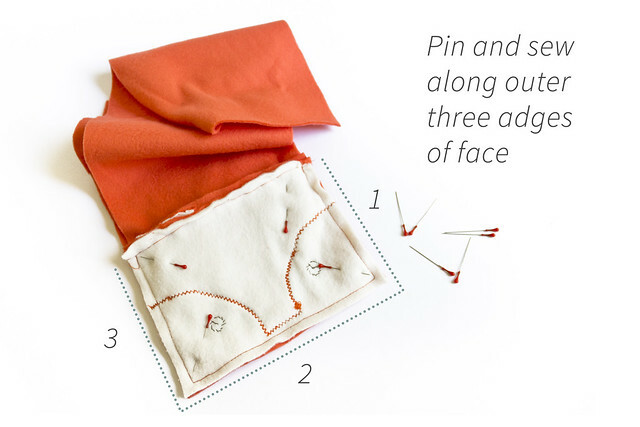 Start by pinning and sewing the orange face piece right side up to the white rectangular piece, also right side up. The longest edges should be aligned. Once these pieces are securely pinned in place, top stitch along the two curved lines and bottom of nose as shown in the picture above. I used a decorative triple zig-zag stitch to highlight the stitching, but you might use any top-stitching you fancy, as visible or subtle as you like. 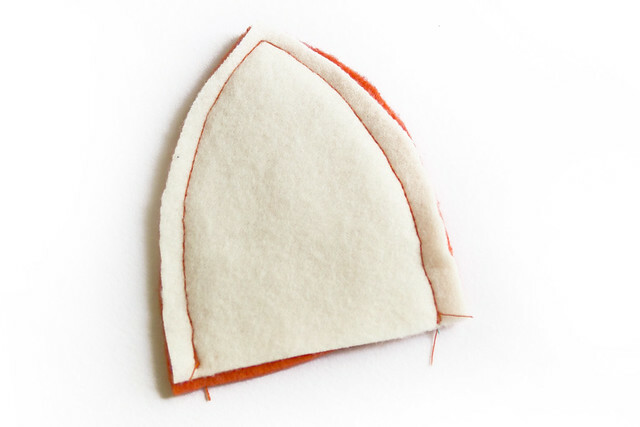 Next, piece together the ears by stacking together one orange and one white ear piece, right sides together, and sewing along the two curved edges (leaving the straight edge un-sewn). Once you have completed both ears, and whilst they are still inside out, pinch each ear so that the side seams you have just sewn meet, and pin in place. Stitch a small curved dart that begins about 0.5cm from the fold on the white fleece edge and tapers off about half way up the length of the ear (refer to the dotted line in the above picture for clarification). 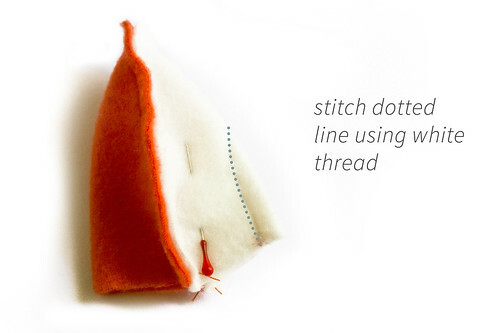 Be sure to use white thread for this so that it doesn’t show once the ears are complete. Clip curves and corners to reduce bulk and turn both ears the right side out. Arrange your face and ear pieces as so: first, place your completed face piece right side up. On top of this lay your two completed ears about 1.3cm from each outside edge at the top of the face piece, orange side up and with the straight edges lining up against the edge of the top of the head (as shown in picture above). Finally, use the longest rectangular piece of fabric, wrong side up, to sandwich the ears in place. Securely pin together, ensuring that pins pass through all layers including the ears, and sew through all layers using a 1cm seam allowance. You might find that some sewing machines struggle with this bit. Mine had a bit of a whine before giving in and doing what it was told, but if yours refuses it might be worth hand-sewing this one seam. You should now have something that looks like the picture about, and it is hopefully starting to resemble a fox. At this point I went and made a cup of tea, and would recommend this to anyone, especially if you also have a biscuit tin that is calling your name. Whilst you are relaxing it is at this point that I would recommend adding the eyes to your foxy friend. You can add a nose, too, if you wish to have this placed a little further up the head than I have mine, but I wanted to leave mine over-hanging the edge slightly, so added the nose at the end. You can add any kind of eyes you fancy, but please bear in mind that unless you have a hard protective face-cover for your device, anything like buttons or soft toy eyes runs the risk of damaging your screen. I decided to use two small felt circles appliquÃ©d to the surface for eyes, but you might embroider yours or give him a different expression altogether. 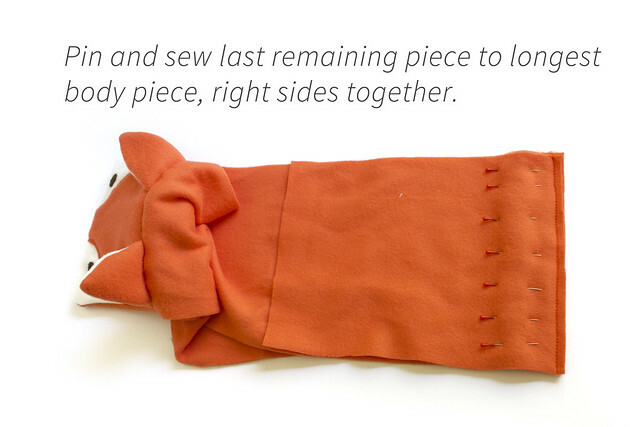 Once the fox’s face is complete, take the middle length piece of orange fleece fabric and lay it face up. On top of this lay the finished face right side down, ensuring that you tuck the ears away from the edges so that they do not get caught in your seams. Pin the two pieces together and sew around the three edges indicated. Turn the face the right way out to check that the ears weren’t caught up in any of your stitching. 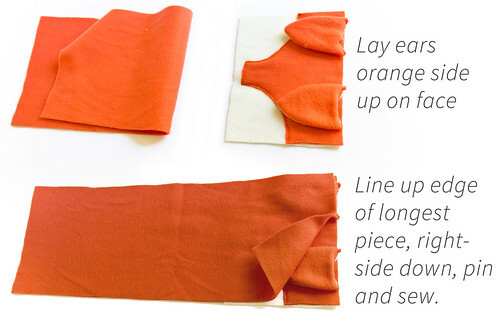 With the longest piece of fabric joined to the head piece and right side up as in the picture, take the shortest orange rectangle and align it on top, pinning it face down along the shortest edge before seaming. Turn the face piece inside out again. Bring the two short edges together and fold the whole piece in half, right sides touching. Pin together along all outside edges. Sew seams 1 & 2 first, stopping when you reach the flap formed by the fox’s face. Once these two seams have been completed, flip the face piece out of the way to the other side and sew seams 3 & 4, ensuring you leave a 1cm gap along the bottom edge for turning. Trim all corners to reduce bulk. It is recommended that if using fleece or any other bulky fabric that when sewing seams 3 & 4, which form the lining of the cosy, that you allow a wider seam allowance of about 1.5cm which can be trimmed smaller once the seams have been made. This will reduce bulk from the lining when the cosy is complete as well as giving a snug fit to the stretchy fleece. Turn the cosy to the right side out through the gap in the lining. 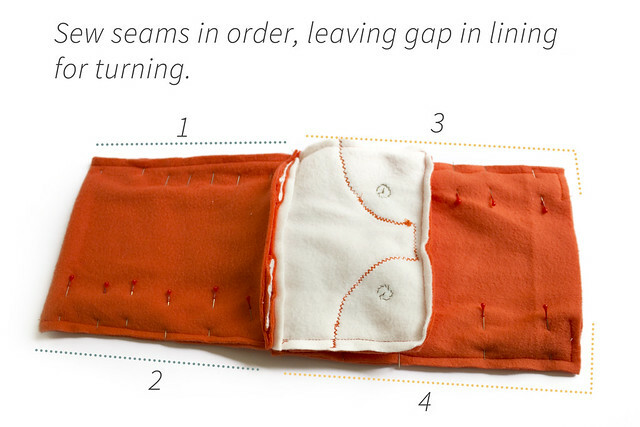 Make sure all corners are pushed out neatly before sewing shut the gap in the lining. Attach a small velcro closure to the underside of the top flap of the cosy and at the corresponding point on the main body of the cosy (velcro will hep ensure that there are no sharp or awkward closures that might damage your device).Finally, attach the felt nose so that it slightly overhangs the bottom edge of the iPad/Kindle sleeve. 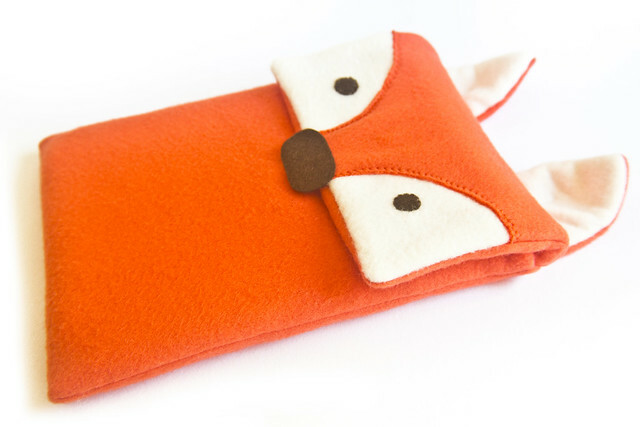 Have fun making your own FOXY protective case for your precious device. That’s really cute! Also, your tutorial is outstanding. The new site looks great! I love following your blog and it did show up in my bloglovin’. So, so cute!!! 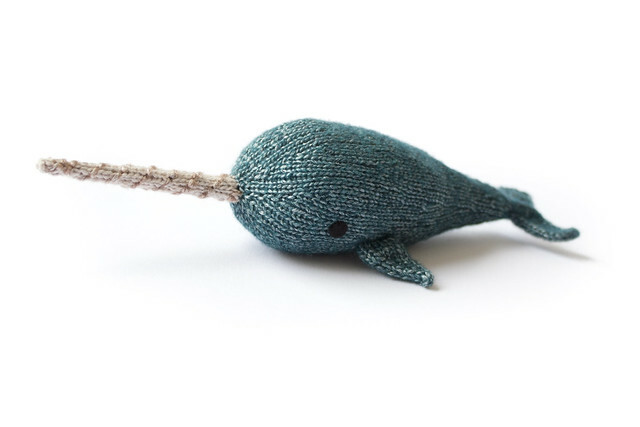 Can’t wait to make one! The site looks really nice. I haven’t had any problems with the RSS feed either. Thanks for another very clear tutorial, the result looks really professional too! fantastic ! very good tutorial ! thank you so much ! I really wish I could sew…. 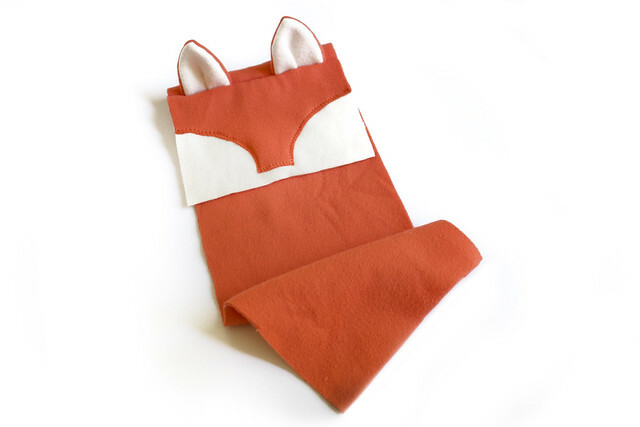 The foxy sleeve is so orginal and super cute!